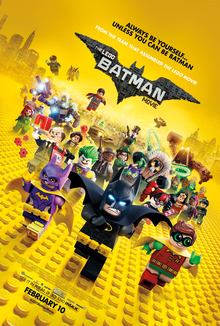 While The LEGO Movie (2014) did a good job of initially not making its universe seem like it was just in the imagination of a 10-year-old child, The LEGO Batman Movie (2017) dispenses with that illusion and goes full-bore into the child-like mind. From the dialogue to the wide variety of licensed characters to the regular “pew, pew pew” sounds made when guns and lasers are fired, The LEGO Batman Movie steps right into what you’d expect a movie about a children’s building toy would be. Of course, with Batman being one of the best characters from The LEGO Movie, it’s no wonder why he was first to get a spinoff film. Regarding plot, it was simplistic. Kids would certainly be able to “get” that family matters, even if they aren’t biologically related. But fear not adults, there’s plenty for you in this film as well. Perhaps the best mark of an animated children’s film is the references put in it that make the adults laugh with recognition. The fact that the movie acknowledges and accepts ALL the canon of the Batman universe made me appreciate it just that much more. And yes, I’m talking the 1960’s Adam West version of Batman, as well as some of the obscure (and canon) characters like the “Condiment King” (yes, he’s real). The fact that this broad background of material supports the film’s jokes does make it a little alienating for those who are unaware of its lengthy history. Fortunately, there are enough references to the recent material (like Joker’s plot in The Dark Knight (2008) and Bane’s voice in The Dark Knight Rises (2012)) that will give most adults a “ha!” moment or two. Still, there’s plenty attributes about the plastic building blocks that are also included in the film, to comic effect as well. A fun film filled with flashy action, pop culture references, and dialogue written by a 10-year-old, I give The LEGO Batman Movie 3.5 stars out of 5.